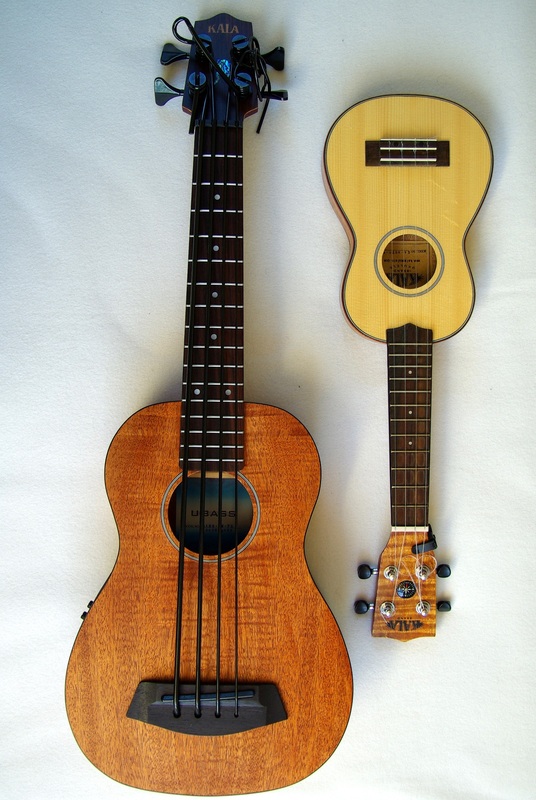 it’s about time to explore the lower end of the musical scale below the usual ukulele sound. 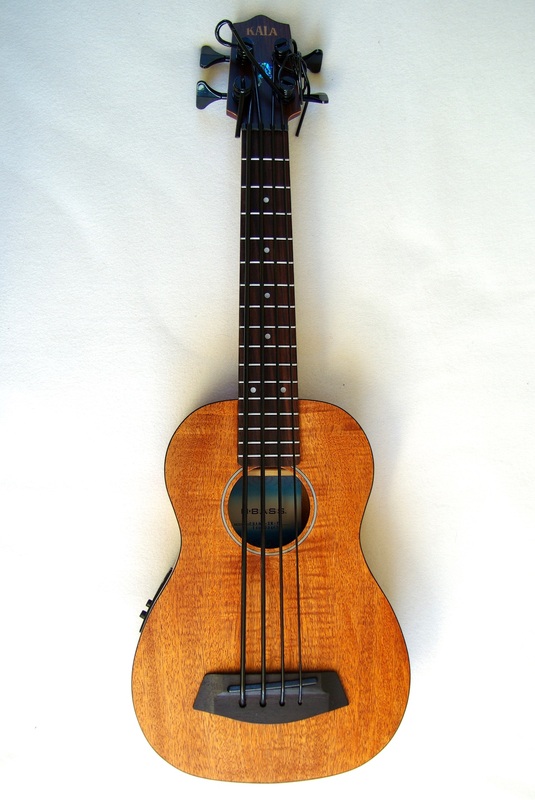 fortunately the people at kala music set up the ubass line some years ago, basically combinig a baritone ukulele with a little magic and some special thick polyurethane bass strings. 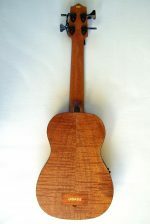 i was always tempted of checking out bass (long before i started playing ukulele) and finally decided to have a closer look at kala’s em fs model. despite the short scale, the ubass is tuned eadg just like an “ordinary” bass (which is many times bigger) – as kala advertises: “more bass, less space”. 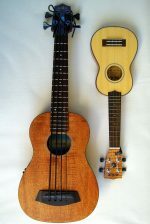 look at the different ukulele pitches in this post to get an impression of what “lower end of the musical scale” means. First impression: it is quite large (not a surprise as i am used to soprano and concert size ukuleles only) and it is heavy (1.1kg) – i will definitely need a strap for this one. soundwise it is “decent” to say the least, loud enough for private environments but will need an amp for bigger audiences. 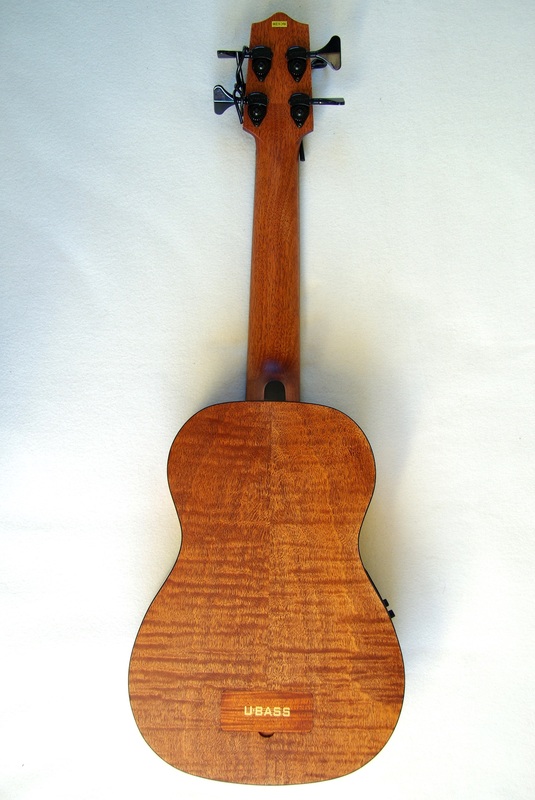 i even doubt it would be loud enough to compete whith some other ukes in a private session. 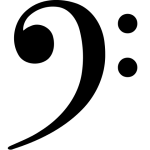 honestly: anything else would have been a miracle, the relatively small baritone body cannot properly resonate the low frequencies (that’s purely physical limitations, not craftmanship or construction). regarding amplification i had a closer look at the phil jones double four and roland micro cube bass rx – both highly recommendable and a nice match to that “miniature” bass. the strings seem to stretch forever, after some initial stretching i had to readjust them completely to avoid overlapping turns on the pegs – thus i still have quite some slack on the pictures below. a quick update regarding the strings: in dec 2015 i swapped the black road toads to a set of aquila reds – and i haven’t had any regrets since. the aquilas feel differently sticky, but in any case they produce a lot more volume unamplified. this should be enough for a private session w/o amplification now. and they add an interesting touch of color as you can see in the header image.